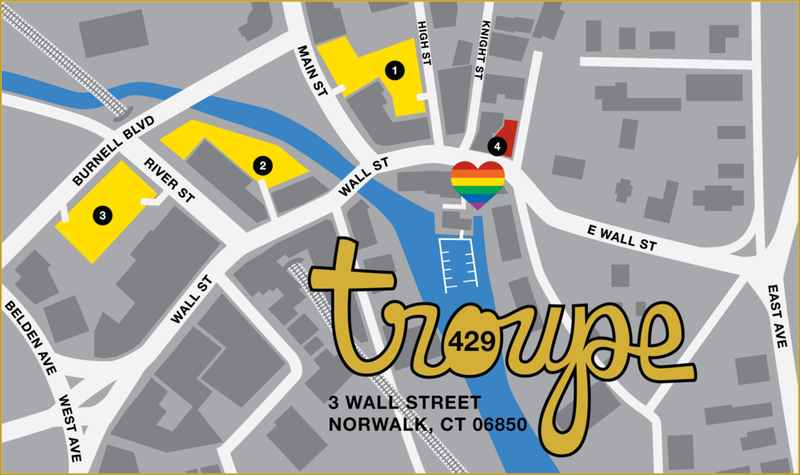 Troupe429: LGBTQ Bar & Performance Space is located in a historic 1860's brick building. We are street level right next door to Peaches restaurant. Come visit us 7 days a week! Take Exit 16 and head north on East Avenue for .7 miles. Turn left onto Wall Street. Troupe429 is .1 miles on the left. Take Exit 1 and head east on Belden Avenue for .4 miles. Turn left onto Wall Street. Troupe429 is .3 miles on the right. Take Exit 40A and head south on Main Ave for 1.8 miles. Turn left onto Wall Street. Troupe429 is 300 feet on the right. Along Wall St | Main St | High St | Knight St | FREE for 2-hours. This is a private parking lot and vehicles will be towed or booted. STAY THE NIGHT IN NORWALK! Troupe429 is located .3 miles (6 minute walk) from The Norwalk Inn & Conference Center. Mention Troupe429 when you book your reservation for $10 off the nightly rate. Click here to book a room. See you soon! Please note: seasonal booking rates may vary.